SAGA (Kyodo) An ancient bronze bell believed to date back to the second or third century has been unearthed from the Yoshinogari archaeological site, the Saga Prefectural Board of Education said Thursday. It is the first time that a "dotaku" has been excavated in the Kyushu region, the board said. The dotaku was discovered on the northern side of the Yoshinogari site in Kamisakigun, Saga Prefecture, which was found to have originally been surrounded by a large moat in the Yayoi Period (300 B.C.-A.D. 400). A large number of native bronze bells have been discovered in the Kinki region, but no such discoveries have been made in Kyushu, according to the prefectural board of education. However some stone-made dotaku casts dating back to the mid-Yayoi Period have been found at archaeological sites, including the Yasunagata site in Saga Prefecture, the board said. Koichi Mori, a professor of archaeology at Doshiya University, said the discovery is of great significance because it indicates dotaku had been used for ceremonies in the Kyushu area as well. The dotaku in question was buried under 80 cm of soil at the Yoshinogari site and was found with its top part the "chu," in an upright position. A small section near the bottom of the bell was broken off during excavation but may be restored later, extending its length to 20 cm. The surface of the bell was decorated with "ayasugi" (Japanese cedar) patterns but its inside was damaged, the education board said. Since no relevant fragments were discovered in the vicinity, it is believed it was intentionally damaged before it was buried, it added. In Northern Kyushu, small bronze instruments similar in shape to smaller dotaku are thought to have come from the Korean Peninsula. Hideji Harunari, director of the National History and Folklore Museum's Archaeological Research Department, said the dotaku was most probably produced in Kyushu in view of the circumstances in which it was discovered. Its shape is also unique to other bronze articles found in the area. The discovery has raised the possibility that dotaku, which are believed to have originated in the Kinki region, including the Nara area, originated in Kyushu, experts said. 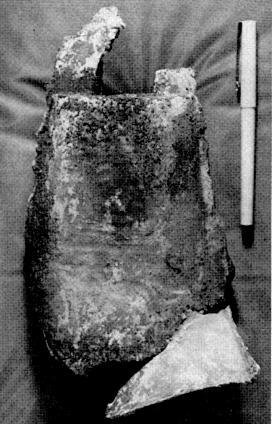 In 1980, part of a stone dotaku cast about 20-cm high was excavated at the Yasunagata archaeological site in Torisu. A similar cast has also been discovered in Kasuga, Fukuoka Prefecture, in southern Kyushu. Tadashi Nishitani, a professor at Kyushu University, said: "It is conceivable that the 'sho-dotaku,' or small dotaku-like instrument, first came to Kyushu from the Korean Peninsula in the first or second century, and then migrated to the Kinki region. The latest discovery may show that the sho-dotaku evolved into a Kinki-style dotaku. "In Kyushu there must have been times when large bronze bells had replaced bronze shields for large national ceremonies," Nishitani also said. Hiroaki Takakura, a professor at Seinan Gakuin University, however, said he thinks that the latest exhibit only suggests that some people in the Kyushu area conducted ceremonies in a Kinki style. About 480 bronze bells have been discovered in this country, usually singly or in parts. The bells have elongated bodies, oval cross sections and are open at one end. Semicircular hands are cast at the top, and most bells have flanges on the side seams.